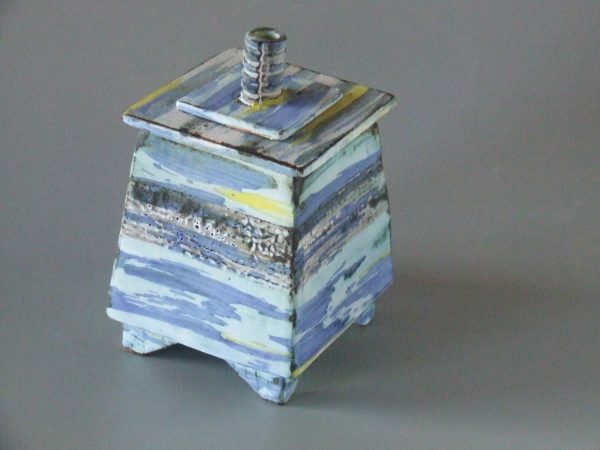 My hand built boxes, vases, wall pieces and vessel forms feature washes of cobalt and copper with occasional ‘pops’ of yellow over a matt white glaze on top of textured surfaces. I want to evoke a feeling of the sea shore and coastline so these are imagined seascapes/landscapes rather than illustrating a specific view, encouraging the viewer to see their own ‘picture’. Some are stormy and others quiet and calm.